This project is fun to make and will get hours and hours of use no matter the weather. 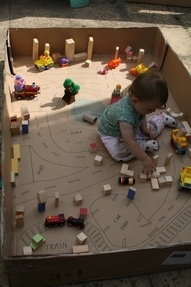 Kids can let their imaginations run wild and include whatever they like in their own special town. All you need is a BIG cardboard box, or a couple of smaller boxes secured together. As an added bonus, it keeps really little ones contained whilst they happily play. Everyone’s a winner! This entry was posted in creative stuff, stuff for play and tagged cars, create, DIY, games, garage, paint, play room, rainy day by rudyandthedodo. Bookmark the permalink.